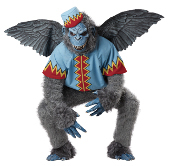 The land of oz is a far less threatening place if you take out the flying monkeys. The wicked witch of the west employed these evil apes to kidnap dorothy, the scarecrow, tinman and lion and whisk them off to a showdown at her witches castle. Fly my pretties!